From Flickr: “Mary Pickford” by Truus, Bob & Jan too! British postcard by Rotary Photo, London, no. S 62-4. Photo: Moody, N.Y. Caption: "This is a Real Photograph on Rajar Bromide Card." 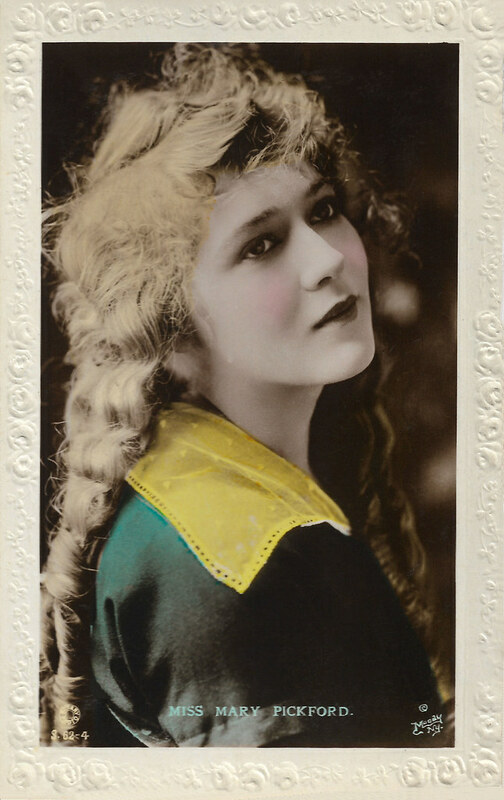 Mary Pickford (1892-1972) was a legendary silent film actress and was known as ‘America’s sweetheart.’ She was a founder of United Artists and helped establish the Academy. Mary Pickford was born Gladys Mary Smith in 1892, in Toronto, Canada. She was the sister of actor/director Jack Pickford and stage/screen actress Lottie Pickford. Pickford began performing at the age of five on the stage and was known for a time as ‘Baby Gladys.’ After touring in different shows and productions for more than nine years, she went to New York to conquer Broadway. In 1907, she made her Broadway debut in The Warrens of Virginia. David Belasco, the producer of the play, insisted that Gladys Smith assume the stage name Mary Pickford. In 1909, Pickford got into film, working for D. W. Griffith, a director and head of the Biograph Company (American Mutoscope & Biograph) . That same year, ‘the girl with the curls’ appeared in 40 films for Biograph (According to some sources even 51 films). In January 1910, Griffith moved his operation to California, and Pickford went with him. Actors were not listed in the credits of the Biograph pictures. Audiences noticed and identified Pickford within weeks of her first film appearance. Exhibitors in turn capitalized on her popularity by advertising on sandwich boards that a film featuring ‘The Girl with the Golden Curls’ or ‘The Biograph Girl’ was inside. Pickford left Biograph in December 1910. The following year, she starred in films at Carl Laemmle’s Independent Moving Pictures Company (IMP). Unhappy with their creative standards, Pickford returned to work with Griffith in 1912. Some of her best performances were in his films, such as Friends, The Mender of Nets, and The Female of the Species. In 1913, she moved on to Adolph Zukor who had formed one of the first American feature film companies: Famous Players in Famous Plays later known as Paramount Pictures. Hearts Adrift (1914) made her irresistible to moviegoers. The film was so popular that Pickford asked for the first of her many publicized pay raises based on the profits and reviews. The film marked the first time Pickford’s name was featured above the title on cinema marquees.Tess of the Storm Country was released five weeks later. Biographer Kevin Brownlow observed that the film "sent her career into orbit and made her the most popular actress in America, if not the world." Over the years, her fame grew as well as her salary. ‘Little Mary’ became an international star, beloved for her beauty and charm. She often appeared on screen in young girl roles, even when she was an adult. Some of Mary Pickford’s greatest films were a collaborative effort with friend and writer-director Frances Marion. Together they worked on such hits as Rebecca of Sunnybrook Farm (1917) and Poor Little Rich Girl (1917). She also worked as a producer and co-founded United Artists, with D.W. Griffith, Charlie Chaplin, and Douglas Fairbanks, Sr., who would become her second husband. She had been married to actor Owen Moore since 1911 and divorced him in 1920 to be with Fairbanks. Mary Pickford and Douglas Fairbanks married in 1920, becoming one of Hollywood’s earliest supercouples. Fans adored the pairing, and the couple were known to host fabulous events at their home, called Pickfair, which were attended many of the leading figures in film. In the 1920s, Pickford continued to score more box-office hits with Polyanna (1920) and Little Lord Fauntleroy (1922). Ernst Lubitsch came to America at Mary’s invitation to direct Dorothy Vernon of Haddon Hall (1924), but when he arrived he had changed his mind and would not do it (it was eventually directed by Marshall Neilan). Instead, he and Mary made Rosita (1923) together. She was one of the original 36 founders of the Academy of Motion Picture Arts and Sciences in 1927. Around this time, the film industry was changing and talking pictures were on the rise. In 1929, Pickford starred in her first talkie Coquette, which explored the dark side of a wealthy family. She won an Academy Award for her work on the film. Still she was never quite able to recreate the phenomenal success she had in the silent pictures with the sound films. Her last film was Secrets (1933). Mary Pickford retired from the screen in 1933 but continued to produce. In 1936, she divorced from Douglas Fairbanks. A year later, she married her third husband, actor and band leader Charles ‘Buddy’ Rogers. They stayed together until her death and adopted two children. Mary Pickford died in 1979 in Santa Monica, California. Sources: The Biography.com website, Wikipedia and IMDb.